members, with their diverse backgrounds, experiences and expertise, were drawn from the global community of professional surveyors. While individual surveyors have had a substantial involvement in climate change studies for almost three decades, it wasn’t until 2002 that climate change issues became a formal part of the deliberations within the International Federation of Surveyors (FIG). The initial emphasis was on climate change and sustainable development – an emphasis that lead to a number of FIG publications and declarations. These were then followed by a series of initiatives that were substantially focused on how the coastal and marine environment should be managed in the light of likely future climate change. In 2008, an FIG working group was formed to investigate spatial planning in coastal regions. This working group, in producing its report in 2010, noted that from a surveyor’s perspective climate change issues were not restricted to the coastal zone alone, but rather were diverse and cut across many other dimensions of the surveyors’ professional activities. The FIG Task Force on Surveyors and Climate Change set out both to explore and report on where and how surveyors could assist the global community in measuring and monitoring climate change, and also to elaborate on the part that they could play in adapting to climate change and helping to mitigate its impacts. 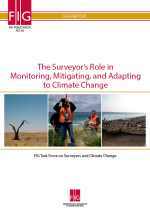 This publication provides a detailed summary of how the professional skills of the surveyor can be leveraged to help the global community as it grapples with the climate change issue. In reading the document it becomes clear that in many regards surveyors are not only the custodians of enabling technologies that are critically important to understanding climate change impacts, but that by virtue of their multi-disciplinary skills, they provide the bridge across the divide that can often exist between those who work in the natural sciences versus those working in the social sciences. It is thus a document that covers a broad spectrum of thoughts and practice, bringing about the convergence of the spatial and societal aspects of climate change. The efforts of the Task Force are to be applauded and appreciated. We acknowledge the efforts and contributions of the authors in providing such a comprehensive document. It is our hope that it will not only spur surveyors on to a greater contribution to climate change studies, but that it will also alert global agencies as to the knowledge and resources that the surveying profession can bring to the table as climate change policy responses are developed. emergency response and recovery operations after natural disasters. However, in order for this data to be correctly interpreted and integrated, it is essential that it not only be time tagged but also given well defined coordinates in a known reference system. Surveyors not only help define these coordinates and the reference systems that produce them but also help design and use the software tools that support the subsequent analyses of the resulting spatial data. Climate change presents challenges across a broad spectrum of human activities. In this regard, the surveyor’s skills have particular application in the following areas. The design of urban communities and urban settlements. Being the home of the largest part of the world’s population, it is in the urban setting that the impact of climate change is likely to be the most acute. The surveyor is both the custodian and a user of the digital tools and the digital databases used in urban planning. These allow the surveyor to analyse planning options and make policy decisions. Nowhere is this more apparent than in developing countries where security of land tenure may be poor and where rapid urbanisation in disaster prone areas leaves people subject to disaster risk with subsequent loss of livelihood. Many urban dwellers live in poor quality homes on informally occupied or subdivided land with little or no protection against climate related disaster events. The surveyor, being skilled in the definition of land boundaries and having knowledge of the associated tenure rights (whether formal or informal), can integrate information with climate resilient urban design processes, thus vastly improving outcomes for many of the world’s disadvantaged peoples. The administration and use of rural areas. Land use is responsible for more than 30% of all greenhouse gas emissions. Changes in land use (such as re-forestation) can thus have special importance in mitigating climate change both by lowering emissions and by removing such gases from the atmosphere. Additionally, many of the world’s farmers are smallholders and pastoralists who are being increasingly affected by changing climate patterns. As they adapt there will be changes to land use as well as livelihoods. Climate-related migration will become a significant issue. Many of the strategies suggested for land use change not only require institutional platforms to promote sustainable land use planning but, just as importantly, a clear allocation of property rights that provide security of tenure. Such activities lie at the heart of the surveyor’s professional skills. With land parcels and their associated rights fully integrated into land use data bases, governments should incrementally be able to improve tenure security and controls on poor or inappropriate land use. The management of peri-urban areas. Peri-urban areas, which are found at the interface between city and country where urban and rural uses of land mix, and often clash, are likely to be affected by climate change migration. In developed countries these areas are generally managed intensively so as to prevent urban sprawl and protect agricultural land use. In developing countries they tend to be areas whose land-use changes rapidly from rural to semi-urban in relatively short timeframes, as people and cities respond to urban expansion or migration pressures. In the absence of long-term policy and planning, and as climate related disasters increasingly afflict agricultural land, people will tend to migrate to periurban lands, thus creating a new suite of problems. To what extent will unplanned urban encroachment be allowed versus the development of planned urban areas? How will those with existing land rights be treated? What land-rights, if any, will accrue to new occupants of such areas? Where will new infrastructure be located? These are questions which the skills of a surveyor are needed to help resolve. (SIDS) where there is only limited institutional capacity to adapt. Improving the tenure security of people living on informal tenures (informal settlements, customary land, tenants and renters), can improve their resilience to natural disasters and other climate-related impacts. This is where the surveyor’s experience, knowledge and skills can be of particular help. In order to help overcome such problems, the UN has devised a programme to reduce greenhouse gas emissions from deforestation and forest degradation (REDD and REDD+). Protection of existing ownership and use rights over the land, natural resources, and the carbon sequestered are critical elements in the success of these initiatives. Surveyors are helping with tenure regularization for existing forest dwellers, and with collective titling for indigenous groups. The establishment of carbon credit markets. Articles 6, 12 and 17 of the Kyoto Protocol establish a market for the trading of greenhouse gas ‘assigned emission units’. Carbon trading takes place both at the Chicago Climate Exchange and in Europe. Apart from this ‘compliance’ market a voluntary retail offset market has also developed. At issue is the question as to whether or not an voluntary emission right creates a property right. Are carbon credit units financial products or property rights? If property rights, then the surveyor has an important role to play in recording these rights. The development of large scale agriculture. Biofuel production, as a substitute for fossil fuels, has the potential to expand rapidly. This will result in greater competition for land access resulting in a need for better governance of land and resources. Here again secure property rights, transparent processes and a legal framework to enforce such rights for both investors and local land right holders are crucial preconditions if necessary investment is to occur. Additionally, however, the surveyor is able to use a combination of analysis and precise measurement technology [Geographic Information Systems (GIS) and Global Positioning Systems (GPS)] to assist in both defining agricultural management zones and in the optimal spreading of seeds, biological control agents and fertilisers. The development and use of water resources. Climate change will have significant consequences on the hydrological cycle, and will pose risks to drinking water supplies. The growing pressure for access and rights to use the world’s freshwater supplies highlight the need to have well defined water boundaries and usage agreements between countries, provinces and neighbouring landowners. Here the surveyor plays a critical role, not only in defining and mapping the spatial extent of such resources, but also in determining the spatial extent of their associated covenants and agreements. Furthermore, when it comes to constructing the infrastructure required to conserve and deliver water to where it is needed (e.g., dams, canals and pipelines) it is the surveyor who provides the precise measurement data needed to ensure the success of such projects. The construction of physical infrastructure. Climate change has the potential to impact significantly on the integrity and reliability of physical infrastructure such as pipelines, electricity grids and transportation networks. Not only is spending on the world’s basic infrastructure in severe deficit (currently amounting to $2.7 trillion/ year when it ought to be $3.7 trillion/year), but the impacts of climate change are likely to exacerbate the problems that already exist. Much of this infrastructure is aged and has not been designed for increasingly severe weather events. Furthermore, as climate migration occurs, there will be a commensurate need for the construction of new infrastructure where new settlement occurs. The construction of the engineering infrastructure used to meet these human needs require precise spatial positioning – a function that is solely the domain of the surveyor. The spatial definition of the land, its acquisition, and the easements necessary to provide legal security for such infrastructure, is again the domain of the surveyor. The use and conservation of energy. CO2, arising from fossil fuel contributes almost 60% of anthropogenic greenhouse gas emissions. Strategies for the mitigation of CO2 emissions include improving energy efficiency, conservation, the use of renewable energy resources, and the clean use of fossil fuels. Building orientation and design (essential elements in energy efficiency) can be improved – these being influenced by the shape and orientation of the underlying land allotments defined by surveyors. Heat leakage in buildings can be determined by using infrared aerial photography, and small scale generation (rooftop solar panels) improved. This can be done by building 3D models of cities using LiDAR scanning technology. This gives the surveyor the opportunity to define the orientation and surface of individual rooftops and shadow effects, showing the most favourable spots for solar panels. In addition, the surveyor’s data integration, spatial planning, and measurement skills are necessary elements when constructing large scale facilities for renewable energy generation or the storage of CO2. The spread of disease. Climate change is having an increasing effect on the spread of diseases that not only affect humans and animals but also the general ecological environment. The surveyor has both the enabling technologies that allow the spread of diseases to be tracked and also the GIS tools that allow various spatially referenced databases (e.g., topography, water bodies, insect or animal locations) to be integrated with statistical and meteorological models thus allowing the prediction of future infestation or spread. As humanity seeks to respond to the climate change challenge, and as it considers this broad spectrum of sectors where the surveyor’s core skills can be leveraged, several common themes emerge. Land administration systems. There is an urgent need for cadastral, land tenure, and land administration systems that fully reflect property rights and give tenure security to all legitimate landholder. In the first instance, these systems need to be accessible and able to be integrated with other land use and climate risk data so that climate change mitigation and adaptation strategies can encompass the spatial extent and rights of land owners and land occupiers. In addition, ‘unbundled’ property rights also need to be considered so that carbon credit titles, for example, can be registered and separated in land administration systems. Such developments as these are crucial if the climate related land use changes that will inevitably occur are to work to the benefit of the human race. Surveyors are not only developing “fit-for-purpose” approaches that are aimed at all tenures along a continuum of land rights, but they are also developing formal land administration systems to help with the demarcation of boundaries, cadastral and participatory mapping of social tenures, and with the recording of rights. Spatial monitoring and measuring. Precise spatial measurement, which is the most traditional and best known skill of the surveyor, assists not only in monitoring the impacts of climate change but is also an essential element in adaptation strategies. For example, sea level change analyses require the precise spatial monitoring of tide gauges, using both conventional levelling techniques and GPS positioning. Land use decisions and erosion control are typically based upon detailed topographic mapping that may come from conventional land surveying techniques, or from laser scanning, or from digital image analysis. Precision agriculture (an important technique for increasing crop yields) relies upon GPS measurement technology. The construction of the new engineering infrastructure needed to support climate change adaptation requires the use of levelling, total station, and GPS technologies. Spatial information management. The development of digital land related databases not only involves the comprehensive collection of relevant data, but also its integration into a common coordinate framework. This integration then needs to extend to the integration of social, economic, environmental and geographical factors so as to allow data mining, interpretation, and visualisation of different climate change mitigation and adaptation strategies. These design and integration functions can be undertaken by the surveyor. Adaptation and disaster risk management. A range of adaptation strategies can be embedded into a land administration system so as to control the occupation and use of land and protect the vulnerable. Furthermore, disaster risk management and climate change proofing are core adaptation strategies for the urban environment. The identification of land suitable for the resettlement of climate refugees, the provision of secure land rights, and then the development of the necessary infrastructure are all essential tasks that can be undertaken by a surveyor. Land-use planning. Long term spatial planning is an essential part of greenhouse gas emissions reductions. In areas with high levels of land administration capacity (typically the developed world), energy conservation is being achieved through improved design processes. In areas with low levels of land administration capacity, poor records, limited enforcement of land use policies, and poorly regulated land markets, the challenge is to find innovative ways for undertaking necessary land use planning. government agencies and global agencies in order to deliver these solutions.